Chaplain, Royal Navy, HMS Aboukir. He was the son of Thomas and Ann Dean Uphill Robson, and studied at Clare College, Cambridge, where he obtained a BA in 1904 and an MA in 1913. Following Clergy Training at Leeds he was made a Deacon in 1912. He was ordained Priest by the Bishop of St. Albans in 1913, serving his Title as Curate of Malvern College Mission, Barking Road from 1912-14 and then at Hitchin. He was killed in action on 22 September 1914 aged 32. He is remembered on the Chatham Naval Memorial 1. HMS Aboukir was a light cruiser built on the Clyde (Fairfield, Govan) and completed in April 1902. She was part of the 7th Cruiser Squadron, North Sea and was sunk by the German submarine U9 along with HMS Hogue and HMS Crecy in the area of the North Sea off the Dutch Coast, known as the Broad Fourteens. The patrol was known as the “live bait Squadron”. He was the first British Chaplain to lose his life during the Conflict. The Chaplains on the other two ships, the Revd George Henry Collier and the Revd Wilfred Frank Proffitt Ellis survived. Information from "They Gave Their Today"
Edward Robson went up to Clare in 1901 from Malvern College. He was in the College Soccer XI in 1903 and was Captain in 1904, In 1903 he took part in a College athletics event in which he was entered for the 2 miles handicap. 'Edward Gleadall Uphill Robson was born in 1882. The family lived in Uphill House on Finchley New Road. This was somewhere between Arkwright Road and Oak Hill. He was educated at Malvern College where he excelled at sport. 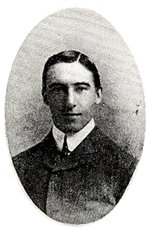 He went up to Clare College Cambridge in 1901, he was captain of Soccer in 1904, the year in which he graduated. He obtained an MA in 1913. In 1911 he was a tutor in Norfolk. He then trained for the priesthood and was ordained Priest by the Bishop of St Albans in 1913. He served as Curate at the Malvern College Mission, Canning Town and then at Hitchin. 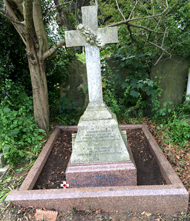 Edward Robson died aged 32 on 22nd September 1914. "In the periscope, a horrifying scene unfolded... We present in the conning tower tried to suppress the terrible impression of drowning men, fighting for their lives in the wreckage, clinging on to capsized lifeboats..."